Life, as they say, is all about finding balance. It’s about fitting in an extra workout so you can splurge on cheesecake for dessert, sitting down to a leisurely Sunday morning breakfast before tackling your crazy-long to-do list, or ordering a big salad with your greasy burger instead of fries. 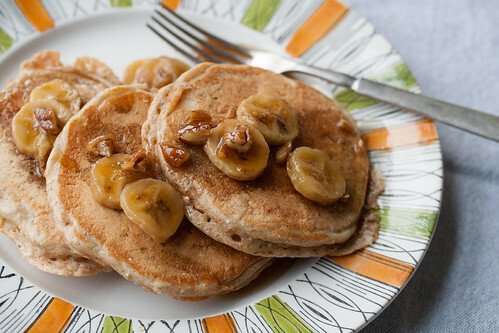 Or, in this case, using a stack of healthy multigrain pancakes to balance out a decadent bananas foster syrup. Because surely one can be excused for having a rum-spiked sweet treat for breakfast when it happens to be paired up with a healthy dose of whole grains, right? Not that I’ve ever been one to eat things that taste bad just because they’re good for me. (Case in point: Kale smoothies. BLETCH. I don’t want to drink my salad, thankyouverymuch.) I just don’t see the point when there are so many other good for me options that also taste good. That’s the beauty of this combo, because the pancakes in question are just as delicious as they are healthy. The multigrain blend gives the pancakes a lovely nutty flavour and hearty texture, which counterbalances the sweetness of the bananas foster syrup. Yup, there’s that balance thing again. 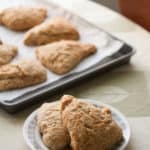 For this recipe, I’ve used a 12-grain flour blend I found at my local Bulk Barn, but if you can’t get your hands on the same product, any other multigrain flour blend like Bob’s Red Mill 10-grain flour would work just as well. And if you’re really in a pinch, a blend of 1/2 cup whole wheat and 1/4 cup multigrain hot cereal is a very reasonable fascimile. Whatever you do, though, don’t skimp on the syrup. 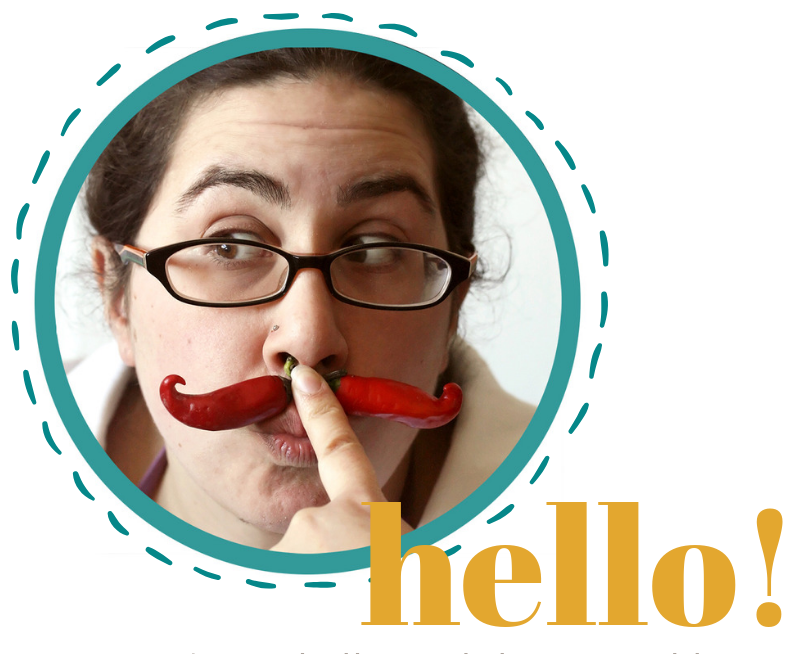 It’s go big or go home, so ladle away with abandon… you can always go for a jog around the block later. 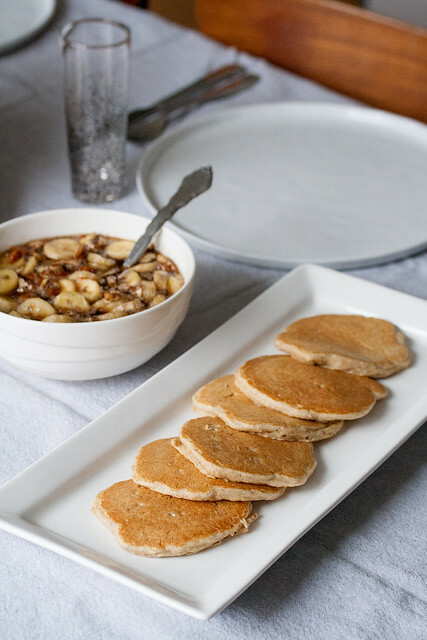 Strike a balance between good-for-you and good-for-your-tastebuds with these healthy multigrain pancakes topped with a decadent syrup inspired by bananas foster. 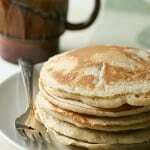 In a small saucepan set over medium-high heat, whisk together the maple syrup, brown sugar and rum. Bring to a bubble and cook for 2 minutes, stirring constantly, until the brown sugar is dissolved. 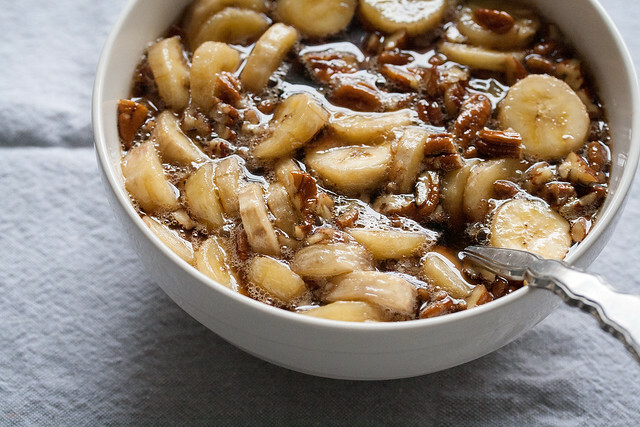 Stir in the bananas and pecans, and cook for 1 minute longer. Pour the syrup into a pretty serving bowl, and set aside to cool while you work on the pancakes. 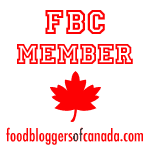 In a large mixing bowl, whisk together the eggs, yogurt, canola, buttermilk and vanilla extract. In a second bowl, stir together the flours, brown sugar, baking powder, baking soda, salt and cinnamon. Add to the wet ingredients and stir until mostly lump-free. Heat a large skillet or griddle over medium heat. Grease lightly with butter. When the butter starts to sizzle, drop in ¼ cup portions of batter. Cook for about 2 minutes, or until a few bubbles start to form on the surface, then gently flip over and continue cooking until golden brown, about 1-2 minutes longer. 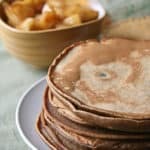 Transfer the finished pancakes to a baking tray and place in a 200F oven to keep warm. Repeat this process until the batter is finished, re-greasing the pan as needed. 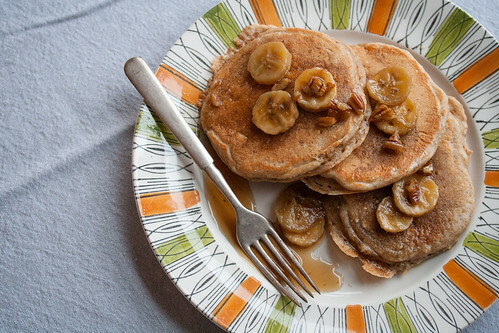 To serve, plate up 2-3 pancakes per person, then top with few generous spoonfuls of Bananas Foster Syrup. A side of crispy bacon is entirely optional, but highly recommended. Needed a topping for the Toasted Coconut Pancake mix I just found at Trader Joe’s. Sounds great …and easy! 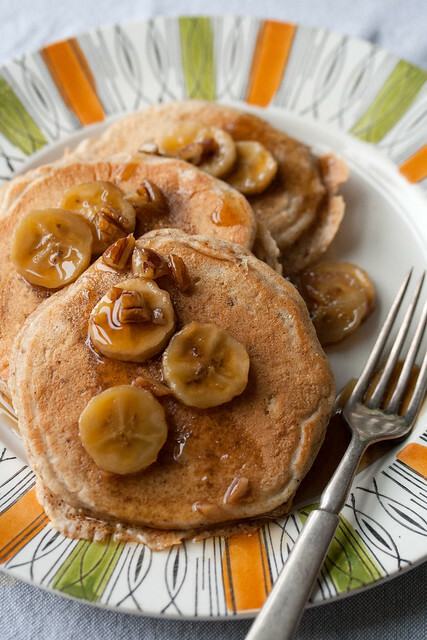 banana foster is my absolutely favorite so yes- this is perfectly balanced with pancakes. 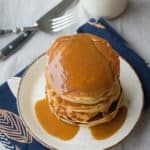 these multigrain pancakes look so hearty and perfect and then that syrup is sooo over the top decadent! love!